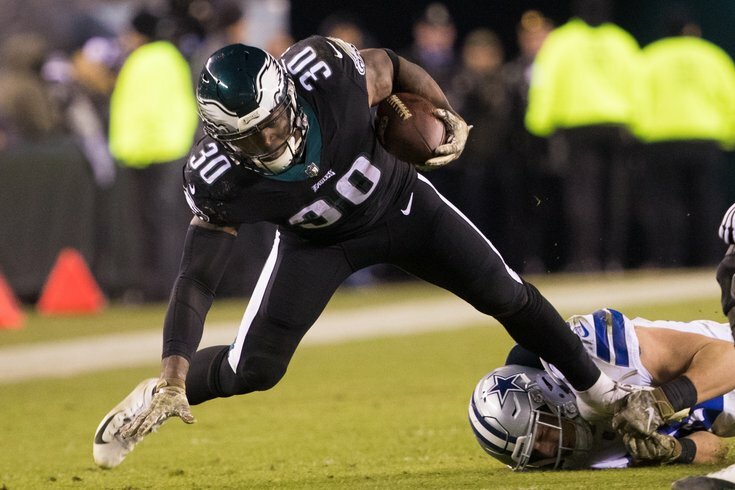 Corey Clement has been one of many, many disappointing Eagles this season. Question from Chris: Who would be your biggest disappointment within the organization, year-to-date? It can be anybody – player, coach or front office. Mine is the coaching staff, but I’m having a hard time deciding which one. Yep, there are plenty of options. For me, the biggest regression that has occurred this season has been along the offensive line. Injuries have been a big part of that, so the regression is excusable to some degree, but they’ve gone from the best offensive line in the NFL (by a country mile) to a rather average one. Question from Hinkie: Who is the most disappointing individual Eagles player this season? I expected more from Corey Clement and Nelson Agholor. First, let’s go player-by-player on the original 53-man roster, and note everyone who has either not lived up to expectations (whether that be due to regression in play or injury), or has not played as well in 2018 as they did in 2017. Carson Wentz, Nick Foles, Jay Ajayi, Darren Sproles, Corey Clement, Mike Wallace, Nelson Agholor, Mack Hollins, Shelton Gibson, Richard Rodgers, Jason Peters, Stefen Wisniewski, Jason Kelce, Brandon Brooks, Lane Johnson, Halapoulivaati Vaitai, Brandon Graham, Derek Barnett, Chris Long, Haloti Ngata, Jordan Hicks, Nigel Bradham, Jalen Mills, Ronald Darby, Sidney Jones, Rasul Douglas, Malcolm Jenkins, Rodney McLeod, Corey Graham, and Jake Elliott. That’s 30 players, and like 90 percent of the starters. That’s not to say that each of the above players have been bad. Wentz, for example, has been great, but this time last year he was the leading MVP candidate. This year, he’s not on that level, as expected. Some players above have been bad, obviously. If I have to pick just one, I think both of your choices of Clement and Agholor are good, but I would say Lane Johnson, mainly because he raised the bar for expectations so high a year ago. Johnson hasn't been bad, necessarily. He has shown toughness, playing through a high ankle sprain, but he gave up two huge plays against the Titans and Vikings to a rookie and a nobody, and has otherwise not quite looked the same, even before he began battling through injuries. Last year, even though he faced an absolutely ridiculous murderer's row of outstanding pass rushers, he was still the clear-cut best offensive tackle in the NFL, in a league full of great ones. I still don't think he gets enough credit for how superb he was in 2017, but the dropoff from his elite play in 2017 to his merely OK play in 2018 has been the biggest disappointment, in my view. Really, you could ask 10 people this question and get 10 different answers. Question from GreenWithEnvy: If the Eagles are mathematically eliminated, should they start Foles over Wentz in order to (a) protect Wentz for next year, and (b) showcase Foles? On the first part of that question, while logical on some level, that won’t happen. You can’t send a message to the team as a whole that they have to go out and risk injury, but the quarterback is just going to pack it in for the season. Wentz wouldn’t want to go down that way anyway. As for Foles, that ship has sailed. If there are teams around the league that are still interested in Foles, they have to do nothing more than wait for him to become a free agent. Question from Brian: We know that Goedert was the team’s top draft choice and barely plays. Now Tate comes over as a high priced rental and barely plays. Given these facts, do you think it is possible that the front office and coaching staff are not on the same page? I wouldn’t read into a disconnect on Goedert. It’s not unusual for a team to ease a rookie in, and I would imagine there can be legitimate challenges in getting a second tight end on the field when your No. 1 is on pace to break receiving records, as in, he’s only getting on the field as the TE2, as opposed to also occasionally taking the TE1’s snaps, which he might do on another roster. As for Tate, I'll stop short of calling it a disconnect, but I would bet that the front office anticipated Tate playing more than 18 snaps in his debut. Question from Holden McGroin: Do you have any idea on why they did not play Tate that much last week? They had a package of plays for him, and there were reports that the Eagles intended on using him creatively. That “creativity” came out when they tried that catch and lateral play with Ertz and Tate in the red zone. I think was the wrong approach. I think they should have prioritized Tate learning the offense as a whole before working on those types of gadget plays, and not the other way around. Question from LostInChiTown: How badly has the comp pick plan backfired? With the Darby and Ajayi injuries, the Eagles are looking at very little in 2020. It looked like Howie had a solid plan – get one- or two-year rentals cheap at the trade deadline, and then get an equivalent comp pick a year or two later. Well, turns out that wasn’t a great plan. This is a debate I had when the Eagles traded for Tate. Many were adamant that the Eagles would be getting a fourth-round comp pick in return when Tate found good money on the open market next offseason. They made the point that the Eagles would be trading a (likely) “late 3” for a late 4, and have Tate for the playoffs. It doesn’t always work that way. A player can have a devastating injury (like Ajayi or Darby did), a guy could just up and retire, the free agent market can be unexpectedly soft at one position or another, etc. There are so many unpredictable factors at play that counting on comps is sketchy, at best. That said, I think the Eagles traded for Darby when they did because they were desperate for corner help. I think they traded for Ajayi because they thought he was good value and would help their offense. The comp picks at the end of the tunnel were more of a bonus if they got them. I do think they made the Tate trade with the comp pick at the end of tunnel in mind. Except, now, the 3 that the Eagles traded for him may not be so “late” after all, and who knows what will happen with Tate over the last seven games of the season. Question from IsMcLeodAnEaglesNextYear: How is the RB class in the draft coming up? Not as good as the running back classes the last two years.